A big bowl of canh ca plus rice makes for a satisfying spring supper. Do you notice the delicate blush of the broth from the rhubarb? Rhubarb ranks way up there, together with ramps and fava beans, as a local vegetable I have absolutely no clue how to tackle. In Singapore, where I didn’t eat my first fresh, fuzz-covered peach until I was 14 and imported smoked salmon cost $50 an ounce (okay so maybe not that much, but you get the point), there was nary a stalk of rhubarb in sight. Every spring since I moved stateside, when a friend waxes lyrical about grandma’s strawberry-rhubarb pie, or my inbox overflows with emails linking to the latest and greatest rhubarb recipes, I’d be as elated as a ladybug chewing on a leaf. I simply didn’t get all the hoo-hah that swirled around spring’s first fruit (right, it’s a vegetable but many American cooks think of it as a fruit because it’s a common ingredient in dessert). After all these years of being reticent about rhubarb, I wondered if I just might be missing out. I also wanted to truly enjoy the Pacific Northwest’s bounty, so I decided to reexamine my feelings toward the pie plant, so named because it’s most commonly used in pie. Of course I had to find a way to use it in an Asianesque preparation. No easy task, mind you. 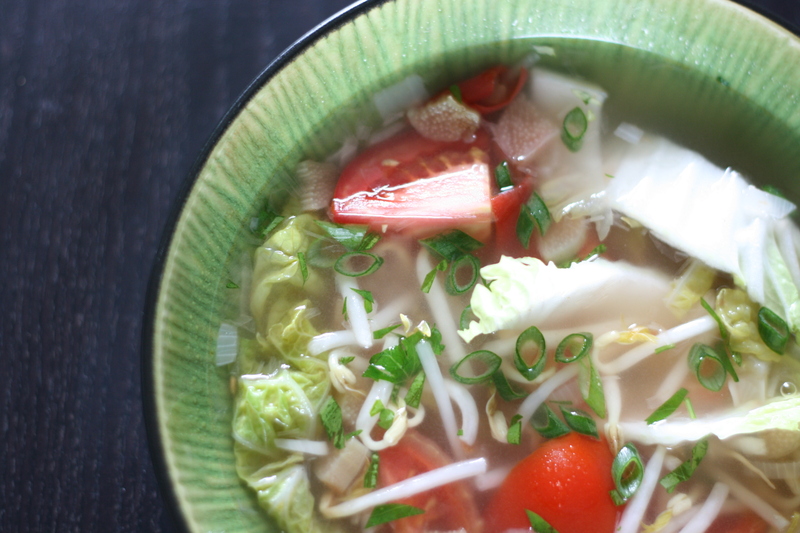 Inspiration eventually came in the form of a Vietnamese sour soup (canh chua). We were celebrating my mom’s birthday with about 20 (!) of her friends at a Vietnamese restaurant in Seattle’s Central District when a big, steaming bowl of soup was placed in front of me. I scooped up some of the crystal clear soup brimming with bright red tomatoes, brilliantly-green baby bok choy, bean sprouts as white and unblemished as a bride’s wedding dress, and of course, the requisite bac ha (aka taro stem) into a bowl. To be honest, I wasn’t expecting the broth to have that much flavor. I didn’t think a clear vegetable soup could! But the tamarind-soured soup was tempered by the right amount of sweetness, and the vegetables tasted as fresh as morning’s first dew. I shamelessly ate four bowls! When I next saw rhubarb at the market, it all came together. Rhubarb is sour. Canh chua is sour. Why not bring them together? Perhaps next year when spring rolls around, I’ll have another stroke of genius, this time on the sweet side. At the very least, I’ll be joining the masses in cheering the joys of rhubarb. If you have an idea for an Asian preparation using rhubarb (especially a sweet one), do leave a comment! If you are unfamiliar with rhubarb (like I was! ), do read this tutorial about handling and preparation. Be sure to remove all traces of the leaves as they contain toxins. The rhubarb imparts a tang that’s a little more coy than tamarind but you end up with a pretty soup tinged a delicate pink. Plus, the rhubarb develops a soft, spongy texture akin to bac ha (taro stem), the vegetable traditionally added to canh chua. Swirl the oil into a large pot and heat over medium heat until it shimmers. Add the garlic and onion and stir and cook until the onion turns translucent, 2 to 3 minutes. Add the chopped rhubarb and stir and cook for 1 to 2 minutes, until the rhubarb pieces soften and turn a shade paler. Pour in the vegetable stock and bring to a boil. Add the white cabbage stalks and cook for 1 to 2 minutes. Add the cabbage leaves and the tomatoes, and cook for another 1 to 2 minutes until the tomatoes soften a little and the cabbage is cooked but still crisp (or for however long you may like). Stir in the sugar and the fish sauce. Taste and adjust the flavors as needed. Turn off the heat and add the bean sprouts, they will cook in the residual heat but still be crunchy. Sprinkle with cilantro and green onions with or without abandon. That’s a great idea. I just saw some rhubarb in one of our local stores. I think I’ll try this. I’ve always wondered who was the poor guy that figured out for everyone else that the stem is edible but the leaves are not. Great minds think alike, Pat:). It’s amazing the similarities between canh chua and sinigang! Brilliant! I always thought that raw rhubarb had a bac ha quality about it! !